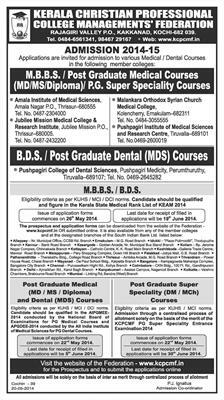 The Kerala Christian Professional College Managements' Federation has invited applications for admission to the MBBS/BDS courses at the member institutions for 2014-15. The applications are being invited for the MBBS courses at (i) Amala Institute of Medical Sciences, Amala Nagar, Thrisuur (ii) Jubilee Mission Medical College and Research Institute, Thrisuur (iii) Malankara Orthodox Syrian Church Medical College, Kolencherry, Ernakulam and (iv) Pushpagiri Institute of Medical Sciences and Research Centre, Thiruvalla and for the BDS course at Pushpagiri College of Dental Sciences, Thiruvalla. Students who seek admission should be qualified as per KUHS/MCI/DCI norms and also figure in the Kerala State Medical Rank List of KEAM 2014. Applicants should be Indian Citizens and should have passed the Higher Secondary Examination recognized of the Board of Higher Secondary Education of Kerala or an equivalent examination recognized. The candidate should secure at least 50% marks in Biology separately and 50% marks in Physics, Chemistry and Biology/equivalent subjects put together. Admissions will be solely based on the merit determined by adding marks obtained in the entrance examination conducted by the Commissioner for Entrance Examinations along with the marks obtained for Physics, Chemistry and Biology / equivalent subjects in the qualifying examination allocated in the ratio 50:50. Separate application has to be submitted for MBSB and BDS. The application forms can be attained from any of the five member colleges on payment prescribed fee by Demand Draft drawn in favour of the 'Kerala Christian Professional College Managements' Federation1 (KCPCMF) payable at Ernakulam. Students can also apply online at the official website www.www.kcpcmf.in. The print out of the online application along with copies of essential documents attaching the photograph and signature should be submitted to any one of the member colleges on or before prescribed date. The allotments will be made throug a Single Window System which is being monitored by the Federation. Allotment to MBBS & BDS Courses will be conducted separate and independent. Students who seek admission for KCPCMF MBBS/BDS 2014 should have to keep in mind about the following important dates. The candidates are required to visit the website www.kcpcmf.in frequently for relevant information, notifications, updates and announcements on admission procedure as no individual communications will be served to the candidates regarding the admission process.